The mushroom cloud from a 1954 high-yield thermonuclear weapon test by the U.S. in the Marshall Islands. Fallout from the blast spread radioactive material around the globe. What happens when a hostile nation headed by an unpredictable leader acquires nuclear weapons? That's the question the world has been asking since Donald Trump and Kim Jong-un started trading puerile insults in 2017. But as historian Jonathan Hunt reminds us, world leaders faced exactly the same dilemma over 50 years ago when China, under Chairman Mao, developed its own nuclear arsenal. Those events demonstrate that the goal of nuclear non-proliferation has always been difficult to achieve. An estimate compiled by the nation’s intelligence services reaches the president’s desk, disclosing that a formidable and reckless adversary in Northeast Asia will soon test a nuclear device. Notorious for its anti-Americanism, entry into the nuclear club by this state, whose government Washington has long refused to recognize, imperils America’s position in the Asia-Pacific. National security officials weigh their options: to pass resolutions in the United Nations, to buoy nervous allies, to send carrier groups, to flex nuclear muscles, to draft arms treaties, to launch a preventive strike. The president instructs his national security advisor and a close family member to approach the ambassador of his country’s archrival about whether they would look the other way if U.S. bombers were to reduce this rogue state’s ballistic-missile and nuclear installations to rubble and ash. An image taken by a U.S. intelligence satellite of the Lop Nur Nuclear Test Range in China in 1964, four days after China tested its first nuclear weapon. In this case, the year was 1963, and Mao Zedong’s People’s Republic of China (PRC) was about to conduct its first nuclear test on October 16, 1964. How Presidents John Kennedy and Lyndon Johnson dealt with the Chinese nuclear challenge set precedents for U.S.-led efforts to shutter the nuclear club, foreshadowing how the United States and the international community has treated those in pursuit of the ultimate weapon ever since, including North Korea today. Tensions between the United States, the Democratic People’s Republic of Korea (DPRK), and East Asian neighbors—China, Japan, South Korea, Russia—have risen. And the war of words (and tweets) between President Donald Trump and DPRK Supreme Leader Kim Jong-un has become must-see-TV. The two nuclear-armed blowhards exchange insults—“gangster,” “dotard,” “madman,” “rocket man”—with Trump boasting of his nuclear button’s size in comparison to Kim’s. Graffiti in Vienna, Austria of U.S. President Donald Trump and North Korean leader Kim Jong-un with their hairstyles reversed (left). One of the many Tweets from Trump in which he refers to Kim as “Little Rocket Man” (right). Yet these tantrums tell us little about why a military technology in the hands of eight other states—the five members of the United Nations Security Council, and India, Pakistan, and Israel—is denied the DPRK; nor about why the United States, which first built the atom bomb, now serves as the bad cop on the world’s nuclear beat. What’s missing is a history of American involvement in East Asia and the mid-century politics of nuclear proliferation during the Cold War. China’s nuclear test brought to a head powerful currents in the early history of nuclear science and technology—America’s military presence in Asia amid decolonization and long-running efforts to place atomic energy under international control because of its potential inhumanity. A map depicting the nations that possess or are suspected to possess nuclear weapons. The global nuclear nonproliferation regime, which came together with the opening for signature of the 1963 Limited Test Ban Treaty (LTBT) outlawing nuclear tests in the atmosphere, under water, or in outer space, and the 1968 Nuclear Non-Proliferation Treaty (NPT) was the fruit of American efforts to weld these movements together. The destructiveness of nuclear weapons, the revulsion toward the bombings in Hiroshima and Nagasaki, and the fear of fallout from atmospheric nuclear testing throughout the 1950s and early 1960s had set the tone for Washington to frame proliferation as a threat to humanity. A view of Hiroshima, Japan after the atomic bomb strike in August 1945 (left). New York schoolchildren during a “take cover” drill in 1962 (right). As the U.S. military found itself mired in Vietnam, China’s nuclear test in 1964 afforded an opportunity to don the mantle of global leadership on an issue of enormous gravity: policing the spread of nuclear science and technology. President Kennedy signing the Limited Nuclear Test Ban Treaty in 1963 (left). A map depicting nations’ status on the Nuclear Non-Proliferation Treaty as of 2013 (right). This marriage of American military power to humanity’s law required singling out the enemies of progress, prosperity, and peace. With its revolutionary dogmatism, anti-American broadsides, and claims to represent an Afro-Asian world shaking off colonialism, Mao’s China made the perfect foil against which to justify worldwide nuclear law and order at the point of America’s sword. Today, North Korean’s totalitarian society, starving population, litany of human rights violations, and exotic reclusion makes it a similarly useful villain for American global aspirations—another rogue state whose acquisition of weapons of mass destruction presents a legitimate target of overwhelming military action rather than firm yet patient deterrence. News footage of President Kennedy signing the Limited Nuclear Test Ban Treaty in 1963. Whether China would force its way into the nuclear club, and what it would do once it did, roiled the international scene in the 1950s. Mao habitually provoked nuclear crises with U.S. President Dwight Eisenhower and the irredentist Chinese nationalists led by Chiang Kai-Shek on the island of Taiwan. In 1955, and again in 1958, the People’s Liberation Army (PLA) lobbed artillery shells at nationalist military positions on the islands that hug the Chinese mainland’s coast near Xiamen in Fujian province, across the Taiwan Strait. The U.S. carrier USS Lexington and USS Marshall off the coast of Taiwan in 1958 (left). A 1958 poster showing Chinese soldiers invading Taiwan (right). The Taiwan Strait crises tested the posture of massive nuclear retaliation with which Eisenhower and Secretary of State John Foster Dulles had sought to deter Sino-Soviet adventures cheaply by threatening immediate escalation to all-out thermonuclear war rather than matching the communist giants soldier-for-soldier and gun-for-gun. Both times, Sino-American brinksmanship (what Dulles called the “necessary art” of getting “to the verge without getting into war”) brought massive U.S. naval exercises and a return to the status quo before the shelling had started. The second time, the Soviet Union, whose nuclear umbrella stretched over China, opted to do more than rap the knuckles of its daredevil ally (the Soviet Union had successfully tested its first atomic bomb in 1949). The mushroom cloud from the first Soviet test of an atomic weapon in 1949 (left). In 1961, the Soviet Union tested the most powerful nuclear weapon ever created and it remains the most powerful explosive ever detonated (right). Moscow had started furnishing Beijing with nuclear assistance in the mid-1950s as part of a larger effort to modernize China’s industry and military: research reactors, scientific training, technical experts, and fissile materials such as uranium-238 (ideal for bombs). Soviet Premier Nikita Khrushchev promised the Chinese an atom-bomb blueprint based on the Trinity design, the first nuclear explosive tested at Alamogordo, NM, near J. Robert Oppenheimer’s Los Alamos, which a German-born, British spy Klaus Fuchs had spirited out of the Manhattan Project’s weapons laboratory. Klaus Fuchs’s ID badge from Los Alamos National Laboratory (left). The first detonation of a nuclear weapon in July 1945 (center). A Cold-War–era billboard outside a nuclear production complex in Washington state (right). However, Khrushchev soon moved to cut off nuclear aid altogether. The Soviet leader tired of Mao’s defiance after he had denounced Stalin’s cult of leadership (and by association Mao’s) in a 1956 speech to the 20th Soviet Communist Party Congress, which soon went “viral” despite its secret nature. In 1958, Mao left Khrushchev in the dark about his planned aggression in the Taiwan Strait even though the Soviet premier had been in Beijing just days before. Kennedy’s election in November 1960 looked like it might break the U.S.-Soviet deadlock on nuclear arms control. Kennedy found the idea of a Chinese bomb forbidding. 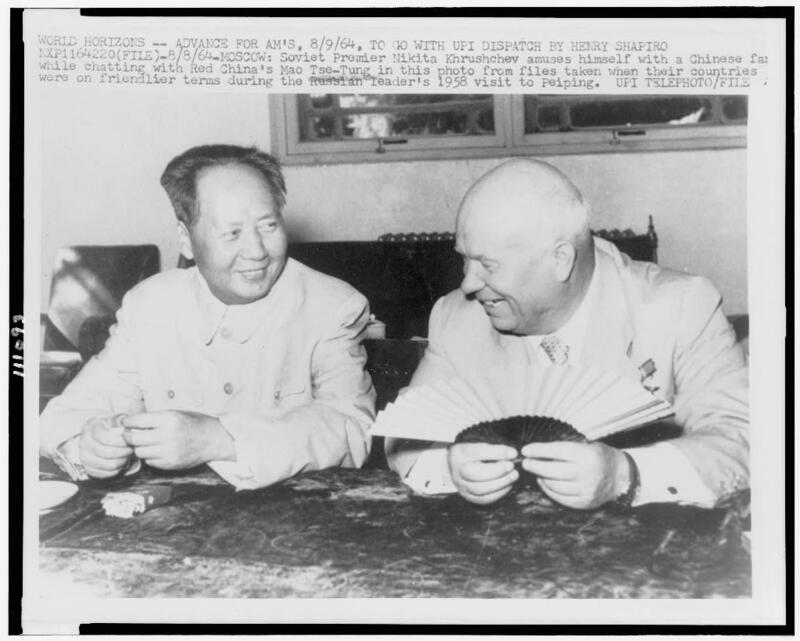 Soviet Premier Nikita Khrushchev and Chinese leader Mao Zedong during a 1958 visit in China (left). Captioned “We use the skill of the Soviet country for the creation of heavy industry,” this 1953 Chinese poster emphasizes Sino-Soviet cooperation (right). The president’s fears transcended the Cold War and reflected racialized fears of Asia. He believed that the People’s Republic of China was more implacable than the Soviet Union because its teeming “Asiatic” masses imperiled the United States’ global mission. President Kennedy with CIA Director John McCone in 1961 (left). President Johnson with McGeorge Bundy in the Oval Office in 1967 (right). Shortly after he declared that he would pursue the Democratic nomination for president, he expressed misgivings to George Kennan, an architect of America’s strategy of communist containment who was increasingly critical of the Cold War’s militarization. Kennedy worried about Kennan’s calls for the United States to stop testing nuclear weapons, forswear their first use, and energetically seek their abolition. “I wonder if we could expect to check the sweep south of the Chinese with their endless armies with conventional forces?” he wrote. An 1899 cartoon of a Chinese man standing over a fallen white woman representing the Western world. Fears of a “Yellow Peril” or “Yellow Terror” grew in the late nineteenth century, relying on racist imagery and fear mongering. It continued thereafter as a vaguely ominous, existential fear of East Asians gaining power over Western nations (left). A movie poster for The Face of Fu Manchu (1965), a film that embodied the racist color-metaphor of Yellow Peril (right). Chairman Mao at 20th Conference of World Communist and Workers’ Parties in 1957 (left). A Soviet propaganda poster captioned “Friends Forever” in both Russian and Chinese (right). A Chinese poster from the 1960s calling for U.S. imperialism to be driven out of Congo. If we fight the war, atomic and hydrogen bombs will be used. I personally believe that the whole of mankind will suffer from such a disaster, one-half of the population would be lost, maybe more than half. I have asked Comrade Khrushchev for his view of this. He is much more pessimistic than I am. I told him that if half of mankind dies, the other half would remain while imperialism would be destroyed. Only socialism would remain in the world. In another half a century, the population would increase, maybe by more than half. This chilling statement was, in many ways, the opening salvo in the Sino-Soviet split—a burgeoning geopolitical and ideological feud between Moscow and Beijing—in which Mao championed “wars of national liberation” while Khrushchev maintained that nuclear war had made “peaceful coexistence” imperative between the capitalist and communist blocs. Mao’s comments and his actions inspired the first proposal for a treaty to close the nuclear club to new members. In September 1958, Irish Foreign Minister Frank Aiken introduced a proposal for “nuclear restriction” at the United Nations General Assembly that would eventually mature into the 1968 Nuclear Non-Proliferation Treaty. By the time Kennedy entered office in 1961, the Irish resolution had stalled, with Eisenhower reluctant to embrace an initiative that might jeopardize NATO’s atomic stockpile, with Khrushchev and Mao waging a battle for the soul of international communism, and with China on the verge of manufacturing its own atom bomb. A cartoon from the 1970s depicting the Sino-Soviet split. The likelihood that China would build the bomb during his first term pushed Kennedy to try to avert it. The administration had three choices: a pact to ban nuclear weapon tests; a variant of the Irish resolution; or military strikes. The first two required the help of the other nuclear powers—the Soviet Union, the United Kingdom (which had tested its first device in 1952), and France (1960). The third risked running afoul of the 1950 Sino-Soviet Treaty of Friendship, Alliance, and Mutual Defense, which pledged the Soviet Union to rush to the nuclear defense of its troublesome ally. A Chinese stamp commemorating the signing of the Treaty of Friendship, Alliance, and Mutual Assistance in 1950. The CIA estimated that China would enter the nuclear club by 1963. The U.S. Air Force was more pessimistic, while the State Department’s Bureau for Far Eastern Affairs treated it as a foregone conclusion. Secretary of State Dean Rusk admitted to the British ambassador in Washington, D.C. that China’s progress toward an independent nuclear capability made its exclusion from arms control negotiations untenable. For the moment, nuclear disarmament became a public rationale for potentially engaging rather than spurning mainland China, whose communist government the United States had refused to recognize, let alone negotiate with, since its victory in the Chinese Civil War in 1949. Chairman Mao proclaiming the establishment of the People’s Republic of China in 1949 (left). President Nixon visited China in 1972, but the U.S. did not formally recognize China until 1979 under President Carter (right). In fact, arms control could justify both China’s inclusion and exclusion from the international community, which granted Kennedy’s nonproliferation policy a flexibility born of its ambiguity. Whether China remained an international pariah would depend on its own nuclear choices. A similar situation exists today. The proposed summit between President Trump and Korean Supreme Leader Kim Jong-un seems to offer a stark choice and possibly unbridgeable bargain: the normalization of U.S.-North Korean relations and the withdrawal of American troops from the Korean Peninsula in exchange for a verified end to North Korea’s arsenal of nuclear warheads and long-range ballistic missiles. In early 1963, Assistant Secretary of State for Far Eastern Affairs Averell Harriman was ringing alarm bells about China’s nuclear program. He related conversations with several Russians, who had mentioned that this issue concerned the Kremlin as well. President Kennedy and Assistant Secretary of State for Far Eastern Affairs, Averell Harriman meeting in the Oval Office in 1962 (left). Harriman (second from left) with Soviet Premier Nikita Khrushchev (third from left) in Moscow in 1959 (right). He counseled Kennedy that an international arrangement would have the advantage of universality and impartiality. According to his Soviet friends, “world opinion” would have to follow the superpowers’ lead. He even suggested that, if all else failed, Kennedy should consider a preventive strike against China’s nuclear facilities. For China to acquire its own atomic weapons—and China was not alone in this aspiration—heralded more than a heightened risk of nuclear war. U.S. policy-makers believed that nuclear proliferation jeopardized U.S. political and military interests across America’s globe-spanning empire of military bases, alliances, and covert assets. A chart depicting the number of nuclear tests by country from 1945-2013. For U.S. officials, Mao’s China was nonetheless the most troubling “ Nth country,” referring to the theory that proliferation anywhere would beget proliferation everywhere. If China went, Japan and India might not be far behind, followed by Pakistan, Indonesia, Taiwan, Israel, and Egypt. In time, even European states like West Germany and Sweden would feel compelled to match their new Asian competitors. Ultimately, the Kennedy administration moved to preserve American influence in a vital region and its credibility worldwide. A U.S. Civil Defense booklet commissioned by Secretary of Defense Robert McNamara in 1961 (left). President Kennedy and McNamara meeting in the Oval Office in 1962 (right). Secretary of Defense Robert McNamara described the spread of atomic forces as a game-changer, its strategic implications calling into question the verities of the Cold War. A world in which many states fielded nuclear arsenals was no longer bipolar. From official Washington’s point of view, for Beijing to get its hands on five small atom bombs was more dangerous than Moscow acquiring another five city-busting thermonuclear warheads.